In life, the daughter of Sylvania’s mad count Otto Von Drak was much like any other of her noble counterparts: vain, immoral and selfish. Upon her father’s death, the first and greatest of the Vampire counts, Vlad Von Carstein, seized the reigns of the province, and was duly married to Isabella. She was soon drawn to Vlad’s intense charisma, and he in turn came to rely upon her unquestioning support and devotion absolutely; what began as a marriage of convenience transformed into a partnership of legend. As she lay dying from a wasting disease, Vlad granted her the Blood Kiss, and she joined him in eternal undeath. Now, Isabella is a powerful Vampire in her own right, and may be seen stalking the front lines bearing the Blood Chalice of Bathori. When she joins Vlad on the same battlefield, their combat prowess is multiplied, each standing shoulder to shoulder with their beloved in death! 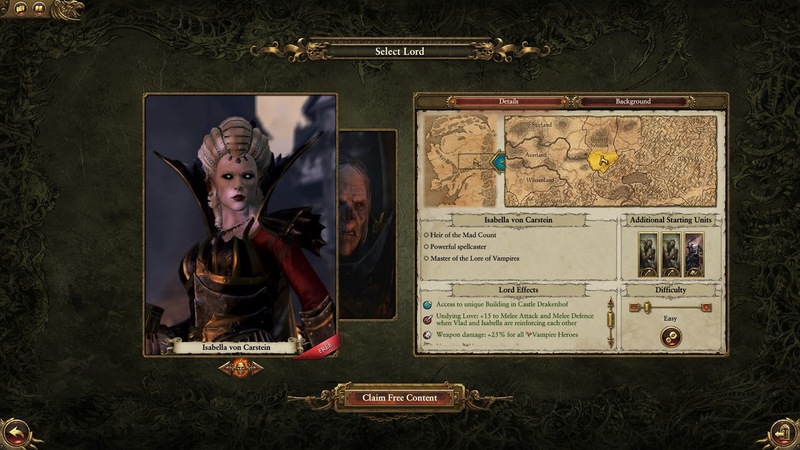 New Legendary Lord joins the forces of Vampire Counts: Isabella Von Carstein. Actually - Isabella off course joins Von Carstein faction with her beloved Vlad Von Carstein. She is free to download from Steam.